The restaurant thanks to the enchanting location, it is the ideal place to dream for the organization of prestigious events. The "Ballroom" set in a beautiful conservatory, made and set with elements of the area, such as wood, iron and exposed rock, opens into the garden and offers the opportunity to enjoy an unparalleled view of Lake Garda and the city of Verona. The surrounding garden looks set to provide maximum comfort for guests, four poster with sofas, chaise longue and relaxation areas, all of which are in harmony with nature in the park. The layout of the buffet is laid out in elegant gazebo that recreate the atmosphere of other times where the magic becomes complicit in creating emotion and dream. 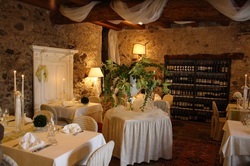 Located in a privileged position surrounded by magnificent Olive trees, the restaurant was obtained from a refurbished ancient Frantoio (Stone crushing Olive Oil maker building) of 1400; it enjoys an enchanted view of Lake Garda. The cuisine offers meat and fish dishes prepared with natural ingredients following a strict criteria. A rich list of particularly selected wines will satisfy any need.